City alumni receive awards at the Professional Publishers AssociationÃ¢ÂÂs prestigious annual New Talent awards. 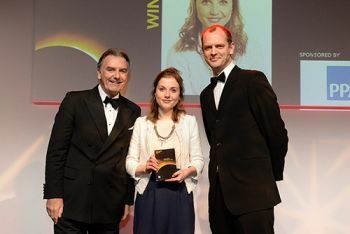 Ellie Austin (pictured, right), who completed the Magazine Journalism MA at City last year, was named Most Promising Student Journalist (Postgraduate) at the Professional Publishers Association's (PPA) prestigious New Talent Awards, last night. City had already made history at the awards by being the first University to have a clean sweep of nominations in the Most Promising Student Journalist Category. This was also the seventh year in a row that a City student has picked-up the award. "I'm completely thrilled to have won but genuinely wasn't expecting it as I know how brilliant the other nominees are. It's a real testament to the strength of the Magazine course, and particularly our tutors Barbara and Jason, that it was an all-City shortlist." There was also award recognition for Journalism alumni from City: Lizzie Pook (Magazine Journalism MA '10), a features writer at Stylist magazine, won New Consumer Journalist of the Year; Heather Spurr, a graduate of City's MA Newspaper Journalism was named New Business Journalist of the Year; and James Waldron, a writer for Chemist+Druggist magazine (Magazine Journalism MA '12) was Highly Commended in the same category. The PPA New Talent Awards celebrate the brightest new stars in UK consumer magazines and business media by recognising the exceptional individuals who are establishing and developing their careers working on magazine and business information brands. "We are incredibly proud of all nine of the shortlisted students - their success reflects the huge amount of hard work, sweat and tears they poured into their time at City. It is also a testament to the talent and effort of the team of lecturers and tutors who teach on the magazine course." Loraine Davies, Director of PPA Careers, said: "Our congratulations go to all the winners of the PPA New Talent Awards 2014 as well as the highly commended entries and those who made it to the shortlist. "Today's consumer magazine and business media brands are evolving at pace, and this event is a fantastic opportunity to celebrate the individuals, teams and - for the first time this year - the companies that are shaping our future." The award ceremony, which took place last night at The Brewery, London, was hosted by the experienced writer and editor Mark Frith.